Jewellery is a window into one's soul, or so the idea goes. From dainty layering pieces to statement cocktail rings, the same piece can look completely different depending on the individual wearing it. As such, iconic pieces have developed over the years, and everyone speaks the same language about them: They are status-making, outfit-changing, conversation-starting and eternally on-trend. A particular bracelet can mark a momentous occasion, but it will continue to garner nods from those in-the-know types forever more. A classic jewellery purchase can be handed down as an heirloom or styled up to look just as current as that medallion necklace trend you're buying into right now. From Bulgari to Chanel, these fashion houses have created some of the most recognizable pieces of jewellery of all time. These dreamy pieces of designer jewellery have helped these luxury brands become household names and have become something of a status symbol in the fashion world. I, admittedly, am one for understated and simple gold pieces snagged at an antique store or flea market, but I would be lying if I said I haven't dreamed of owning a Cartier Love bracelet a few dozen times, and such is its far-reaching appeal. Whether you're looking to buy or looking to browse, go on and have a little scroll through the most important designer jewellery pieces of the modern age. Annabel Rosendahl shared this picture of her dreamy Cartier wedding band, and we are starry-eyed. Nothing says I love you like a little Cartier, right? The Love collection has been around since 1969—with the bangle being particularly popular amongst fashion experts and famously needing its own screwdriver to be fastened and taken off—and will forever be at the top of our most desired list. The Dior Mise En Dior Tribales earrings were first introduced in 2013 in their simplest pearl iteration—they were an instant smash and soon spawned many a copycat as well as many a new version from the Parisian fashion house. The style is still going strong today, and whilst we'll always have a fondness for the most classic double-pearl option, there are more wild takes on the idea out there: See the baubles that look like starry little spaceships or the ones finished with jewel studs. They are the perfect cool-girl evening earrings, but for a more casual approach, pair them with a logo T-shirt, jeans, and kitten heels. The Hermès Clic H bracelet was originally introduced in 2012 as the Hermès H bracelet—but super fans started calling it the Clic Clac and it stuck, according to legend (the internet). This elegant little style—which follows the same H-inspired design as the brand's iconic leather belt and Constance bag—is fashioned from enamel and comes many in different sizes as well as colours. If your style is more playful, follow Alexandra Lapp's lead and double up on logos. 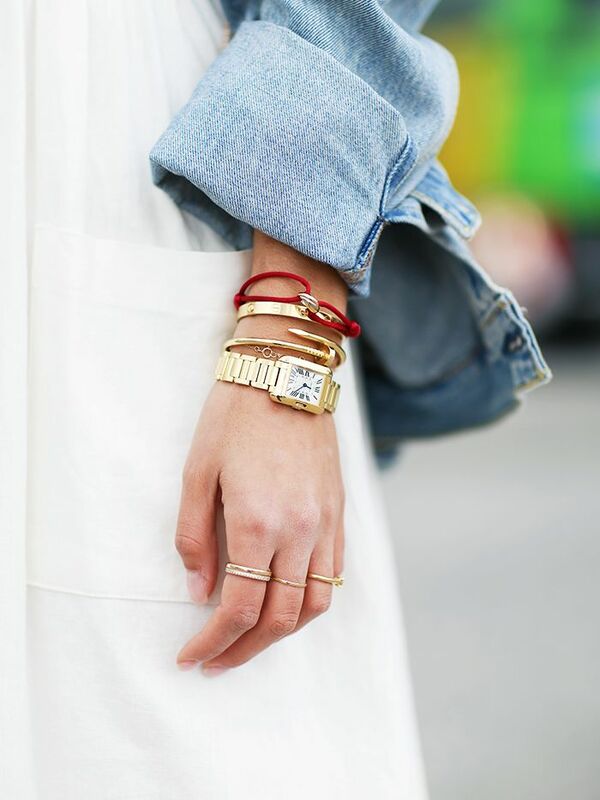 Alternatively, the bracelet will look equally chic with an oxford shirt and denim skirt. Coco Chanel revolutionised the idea of costume jewellery—it was once seen as naff, and although the designer did have a fine jewellery collection (and the brand now creates the most incredible fine jewellery pieces), she radically introduced the idea of wearing semi-precious with precious—like those ropes of pearls, bedazzling, gem-studded brooches or chunky enamel bangles. There are many pieces we'd like to own from Chanel's wide jewellery offering: 1980s gold logo earrings, strands of pearls, delicate diamonds and more, but there's still something unique about picking up one of the intricately designed brooches—no matter your age or personal style. We'd be blowing kisses too if we were decked out in Bulgari ice like Bella. With a sky-high price tag thanks to the complex engineering and high-quality materials that go into making each Serpenti design, it's no wonder that this haute joiallerie range is one the most aspirational out there, and vintage pieces are known to be auctioned for phenomenal amounts: A rare Serpenti watch from 1965 went for over $1 million in 2014 (about £762,900). This snaking design range was initiated in the 1940s via a bracelet design and has been adapted into necklaces, watches, earrings and more—we'd take any of them. Darlings, please remember our birthdays.